I'm done customising my new blog! 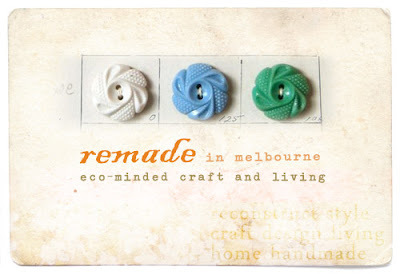 You can now find me at Remade.com.au. Remade is about how to be kind. To the environment. To every soul we share this planet with. And, importantly, to yourself. It has a lot to do with what you buy or don’t buy, because we live in a consumer-driven culture. We are being increasingly defined by the things we have, to our detriment. I believe in the importance of being surrounded by beautiful things you love. But I don’t believe that this must come at the expense of the planet and it’s occupants. Nor do I think we must have ten of every beautiful thing. More is not more. You may already know about the negative effects of buying new stuff. If not, please take a look at The Story of Stuff. This little blog is about creating, thrifting and making do. It’s about living your life on your own terms and according to your values, rather than the values that the advertising industry and their clients force on us. It’s not about sacrifice. It’s about freedom. I don’t have all the answers. I’m certainly not ethically perfect. This blog is my journey to greater ethical living. I hope mine will run alongside yours. One thing I'm definitely planning is to compile some reconstructing/clothes-making tutorials. Stop on over and please let me know what you think! Fabulous Hayley. I look forward to joining you and reading along. I love the look and the ethos. Great stuff! Love the name and try to live by the ideology. I love that you have included being kind 'to yourself'. I won't be posting here anymore. Hope you like the new blog!